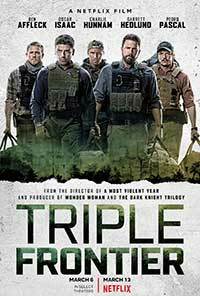 In the latest big Netflix Original film Triple Frontier, William “Ironhead” Miller (Charlie Hunnan) is a former soldier, now working as a motivational speaker, and is addressing a group of special forces while his old military buddy Santiago “Pope” Garcia (Oscar Isaac) takes a Mexican SWAT team into a cartel “shop” bust. Santiago enables pretty informant Yovanna (Adria Arjona) escape certain arrest and, in exchange for freedom for her and her brother, she will help him find the drug lord Gabriel Martin Lorea (Reynaldo Gallegos) who is sequestered deep in a Colombian jungle. 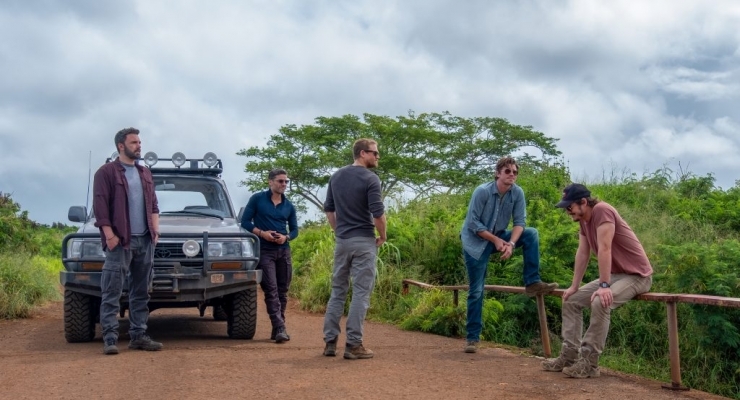 By the way, Triple Frontier refers to territory that Santiago’s soon-to-be assembled team must negotiate in a district that borders Peru, Colombia, and Brazil. In addition to “Ironhead,” Santiago recruits Tom “Redfly” Davis (Ben Affleck) another former special forces soldier who is now a real estate agent with two failed marriages and a young daughter Tess (Mady Wary) to support. Santiago adds the final pair to his team: former wartime buddies, “Ironhead’s” brother MMA fighter Ben (Garrett Hedlund) and professional aviator Francisco “Catfish” Morales (Pedro Pascal) who is currently without a pilot’s license. The plan is quite basic: the group will find Lorea, and rob his “bank” to liberate a bunch of money that will put them all on easy street for the rest of their lives. The somewhat lame justification for this burglary is that these men risked their lives in service to their country and are now struggling to make ends meet. Following Yovanna’s lead (she is apparently trusted by Lorea), the five men will gain access to the cartel jefe’s hidden location. After Tom conducts preliminary reconnaissance, the team carries out their caper, seemingly without a hitch, and take out one gym bag after another filled with the drug money stored in the walls of Lorea’s jungle hacienda. Along the way, they also take out Lorea, but spare his family. Of course, this is only halfway through the film and the gang still needs to get an overloaded helicopter over the Andes Mountains and, when the bird predictably goes down, they must somehow survive a hazardous trek through treacherous terrain and reach the rescue boat waiting for them on the coast. Working with Oscar-winning writer Mark Boal (The Hurt Locker), writer-director J.C. Chandor (A Most Violent Year, All Is Lost) would seem to have everything going for him, particularly with a very strong ensemble led by Isaac and Affleck. Unfortunately, Triple Frontier turns out to be more of a disappointment than another hit for Chandor whose Margin Call script had previously received an Oscar nomination. Triple Frontier also falls far short of the mark set by military-themed caper classics like Ronin, largely due to the Chandor-Boal team’s failure to develop and deliver characters that viewers might actually find worth caring about. This is a critical shortcoming since the real crux of the film occurs after the rather mundane heist by this group of irregulars and focuses on their subsequent struggle for survival. The action scenes are good and often exciting but the sappy ending trivializes all of the travails that the characters had to endure. A definite stumble for a talented creative team and, hopefully, one from which they will bounce back in the future. A disappointing action flick that features a daring heist and subsequent fight for survival in hostile terrain from a creative team that has turned out far better efforts in the past.